Search engine optimization (SEO) has come a long way since it originated around 1991. The search engine plays a vital role in everyone’s lives nowadays. In the world of marketing, SEO is still a large investment of time and resources. And for good reason – buyers tend to rely on search engines to learn more about their problems and to better understand their available solutions. As a content marketer, you need to understand why SEO still matters, how your content creation and SEO affect one another, how to build SEO strategies, and so much more. If you’re a novice looking to learn all things SEO or an expert hoping to brush up on the most up-to-date information, you’re in the right place. This is the ultimate guide to SEO for content marketers. Fido chewed up another bed. You just adopted this puppy last week, and he destroyed three dog beds already. At this point, you’re sick of wasting money on beds that turn into heaps of bed stuffing. It’s time to find a bed that will actually stand the test of Fido’s chompers. 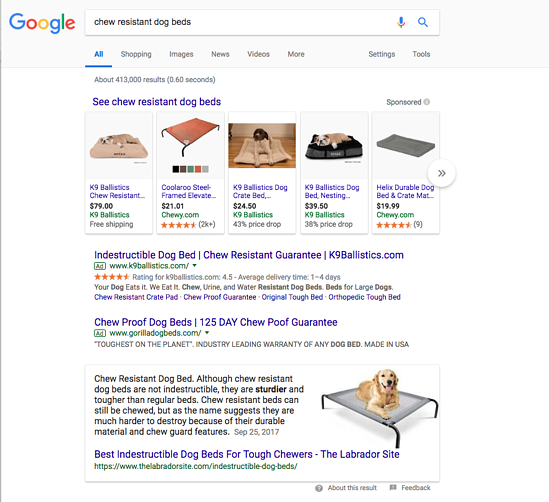 You search ‘chew resistant dog beds’ on Google, and below the ads, you are met with a featured snippet from The Labrador Site. The blog title for the article is ‘Best Indestructible Dog Beds for Tough Chewers.’ After reading the post, you follow up on the option that stands out the most to you – K9 Ballistics. You search for reviews of the company’s top sellers, dig into more customer experiences in Reddit, and finally make your purchase. Thanks to SEO, the Labrador Site ranked high for your query. You found some helpful insights on what beds are the best for tough chewing dogs, and ultimately you found a brand you were interested in. That brand (K9 Ballistics) happens to rank number one for both paid search and organic search, which appears under the featured snippet because they fully optimized their product pages for your search query. This is the magic of SEO and content marketing. A searcher has a specific question or pain point (“my dog chews his bed apart”), submits a query into Google (‘chew resistant dog beds’), and informative content (The Labrador Site blog post) guides the searcher to learn more about the subject, which eventually leads the searcher to make a buying decision. Despite what SEO critics say, the art of SEO is alive and well. And it impacts all marketers, especially B2B. SEO is the top driver of organic traffic, which is highly coveted. It Brings in Qualified Prospects. This comes down to two words: search intent. Searchers want answers, insights, and solutions. These usually start with a question like "how to...," "why...," etc. Searchers are attempting to navigate to a specific website. These searches usually include a product or brand name. These searchers might be looking for features, reviews, etc. Searchers are ready to convert (take a specific action). They’re ready to dive deeper into addressing their problems. Searchers are ready to take the leap and make a purchase. These searches often include purchase-related keywords, like "buy," "pricing," etc. When your visitors find you through organic search, you have an excellent opportunity to gain their trust and demonstrate credibility. This is no secret – building optimized content for your audience calls for a lot of time and resources. You need to research your audience, brainstorm content ideas that align with their needs and interests, create the content, amplify the content, and measure your efforts. However, while this is a lot of effort and investment upfront, you’re building a body of online assets that gain value over time. The more relevant, helpful content you create for your audience, the more indexed pages you have that search engines are crawling. And your ideal visitors can find you through their searches. Content and SEO success go hand in hand. As Ascend2’s 2017 Search Engine Optimization Survey found, 57% of marketing influencers say on-page content development is the most effective SEO tactic used to achieve objectives. Optimized content is the marketing gift that keeps on giving. It Paves the Way For Competitive Opportunities. With other marketing strategies like pay-per-click (PPC), your competition can outspend you. When it comes to your SEO efforts, your competition cannot simply steal your content. What you can do is use spy tools to identify high-value keywords and topics your competitors are ranking high for and develop a strategy to outrank them with higher quality content. Your content is unique to you and your brand. As you create insightful content that outranks your competitors, you’re further establishing your credibility in your industry, increasing your brand’s visibility, and engaging more visitors. Bottom line: Organic traffic will always be valuable to marketers, so SEO will always be an integral part of your overall digital marketing strategy. According to Internet Live Stats, Google receives over 63,000 searches per second on any given day. That’s a lot of people searching for solutions to their problems. HubSpot’s State of Inbound 2018 report found that 61% of marketers say improving SEO and growing their organic presence is their top inbound marketing priority. If you’re not striving to earn organic traffic, your competitors most likely are. The top result wins the lion’s share. Advance Web Ranking’s March 2018 research found that the first position on Google search results on desktop earned a 30% click-through rate (CTR). Your chances of earning clicks drop immensely the lower you rank. But organic traffic doesn’t just appear. You need a strategy and consistent effort to drive real results, which is where your content marketing efforts come in. Your role as a content creator or marketer is more than just create and publish content. SEO and content go hand in hand. Without the right keywords, you won’t rank. Without knowing what your audience is searching for, your content won’t resonate. So how does content marketing and SEO relate? There are too many ways to count. It’s too common for companies to separate the two, but SEO and content marketing are part of the same conversation. To put it simply, content marketing is showing the world you’re awesome, and SEO is being in the right place at the right time. Content fuels SEO, and SEO fuels content. With optimized, informative, targeted content, you can boost your ranking position for searches. And with SEO insights, you can build a targeted, in-depth content strategy that continues to attract (and eventually convert) your ideal audience. The first step is influenced by your buyer personas. You need to step into their shoes and take notice of their specific pain points, goals, interests, and needs. Here at Bluleadz, we consider who our buyer persona is, what stage they’re in within the buyer’s journey, and what specific goals/challenges each piece of content will address. This is when you’re refining content ideas and making educated guesses on possible solutions. You’re showing how informed you are about a specific topic your buyer persona needs help with. As we outline our content ideas, we determine the overall intent of the piece, the format that best serves the reader, and the intended actions and takeaways the reader will gain from each post. The foundation of the scientific method is centered on testing effects against hypotheses. In terms of content marketing, you can set benchmarks for your content to determine if your hypothesis was plausible. For example, you hypothesize that your ebook on manufacturing safety best practices would help your audience (safety management professionals at a manufacturing organization) overcome a specific challenge (updating their safety guidelines). You can set goals for success through specific metrics, like downloads and leads generated. These are also known as key performance indicators (KPIs). Basically, at this stage, you think your audience will love the content ideas you brainstormed. Show how you will you determine if your audience gained value from your content. At this point, you’ve built your ideas based on both research and educated guesses. It’s time to test. This is when you create and publish the content, then prepare to see the results. We use an editorial calendar and track where each piece of content is in our content creation process. This gives our team a bird’s eye view of the overall content marketing strategy. It’s important to know where every piece of content is so you know exactly what to test and when to test it. This is best part. You finally get to see if your experiment worked. We use analytics tools, like Google Analytics and HubSpot Analytics, to measure the performance of each piece of content. You want to look at your KPIs to see if your hypothesis was accurate. This is where you determine how to adjust your content, based on where you fell short.  Where Does SEO Fit Into This Scientific Method Approach to Content? You’re not simply putting up content to fill your blog. With SEO in mind, you’re developing highly targeted, relevant content for your audience, using SEO metrics to measure your optimization efforts, optimizing each piece of content for search, and adjusting your strategy as you build your body of content assets. Every strategy starts with objectives. Just like a road trip, you need destinations to aim for. This is not a set-it-and-forget it approach. There is no perfect goal for you. Your goals will evolve over time. Your goals will differ from others. You will likely fail (and that’s ok). The last point is arguably most important. Understand that failure is part of the process. Falling short means you get to learn where to make improvements to hit your goal next time. Within two months, our blog traffic will add a total of 600 unique visitors by doubling our publishing frequency from four posts per week to eight and by increasing our word count per blog from 600 words to 1,200 words. Within three months, our bounce rate will reduce by 5% by historically optimizing our blog posts with the highest bounce rate. When developing SMART SEO goals, you need to consider what you want to accomplish and how you’re going to accomplish it. Your goals can be geared toward ranking and visibility, traffic, conversions, engagement, profit, and ROI. Let's dive a little deeper into each of these areas. This is an obvious target. When you’re aiming to boost your ranking, your ideal outcome would reach the first result for relevant keywords. When you rank higher in SERPs, you’re increasing your online visibility. Your visibility is about more than just being top of mind for your audience. It’s also about establishing authority and credibility in your industry. Searchers tend to acknowledge high ranking sources as being approved by the search engine gods. Improving your ranking and increasing your online visibility helps you develop credibility, but more importantly, it can lead qualified, relevant readers to visit (and hopefully return) to your site. People don’t simply find you after you put up a website. Without an SEO strategy, you might be wasting valuable time and resources creating content that is buried in SERPs by your competitors. Not all visitors are created equal. For example, if you’re seeing a high bounce rate or short session durations from organic traffic, this proves that your visitors are leaving your website quickly. This is most likely due to the fact that your content isn’t helpful or relevant to what they searched for. What good is all that traffic if your visitors aren’t converting? A conversion is simply defined as a user taking a desired action. This could mean signing up for your newsletter, downloading whitepapers and ebooks, requesting demos, and following you on Twitter. Your conversion rate is the percentage of users taking desired actions. Building your SEO goals around conversions is vital because conversions create leads, who you can then guide to purchase. SEO plays a big role in driving sales and revenue. When you track and measure how your SEO efforts impact conversions, you can prove ROI to your stakeholders. The term ‘engagement’ means something different to every company. There is no clear cut explanation of what engagement really is, so it’s up to you and your team to define it and establish metrics that are related to it. Your engagement metrics should not be purely based on vanity metrics, like overall reach (how many people see your post). These kinds of numbers don’t mean a lot to your SEO and content strategy. Clickbait articles, for example, show why vanity metrics like reach don’t matter. Just because an article earns lots of clicks doesn’t mean it’s successful. Your engagement success should go deeper than this. Scroll Depth is how far down a page someone scrolls. This sheds light on how your visitors are experiencing your content. You can visualize how much they read and where most of them drop off. This is how many visitors are sharing your content via social media. This shows how many visitors find your content helpful and are willing to share it with their followers. How many visitors are adding to the conversation in your comments section? This identifies who is genuinely engaged with your content and what people are saying about it. Ultimately, you need to have hard evidence that your SEO and content tactics are paying off. Profit and ROI are the most difficult (and most exciting) goals to set. Remember, traffic that isn’t converting is ultimately not adding to your company’s bottom line. Coordinate with sales to establish realistic goals, like delivering X amount of marketing qualified leads (MQLs), that earn sales more customers. The most common mistake content marketers and SEO specialists make is thinking strictly in SEO terms when setting SEO goals. You need alignment not just to get buy-in from leadership, but also to get context in how your SEO and content efforts directly impact the big picture and overall company goals. For example, senior leadership wants to increase sales by 15% in six months. Consider where marketing will contribute to that goal. Your marketing team could be focused on bringing in more top of the funnel (TOF) traffic or optimizing conversion funnels, for instance. These marketing goals must be directly tied to those big company goals. 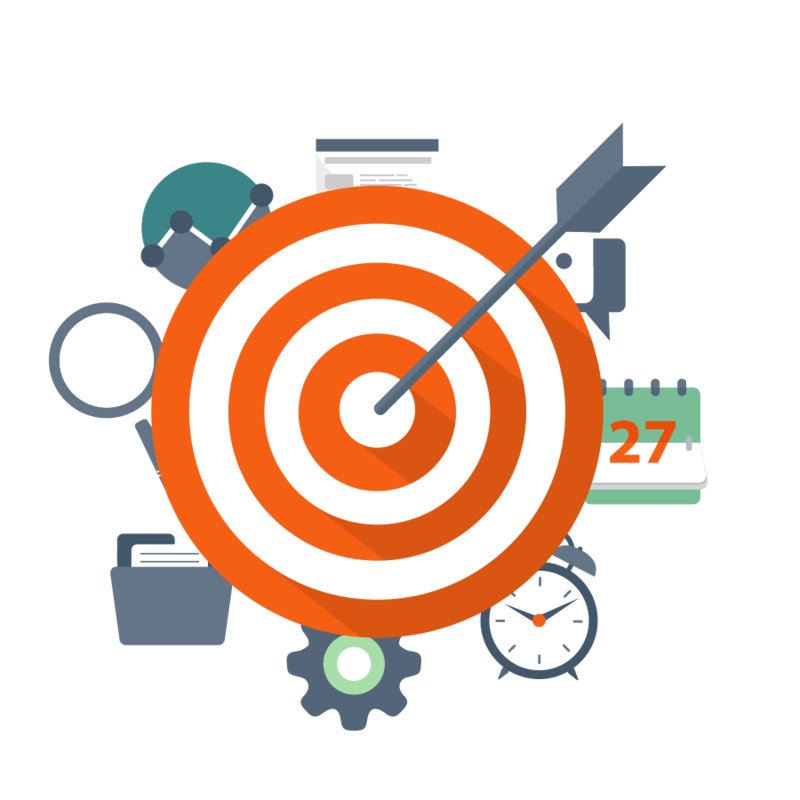 Then, identify what SEO goals will contribute to your marketing goals. This is how you can determine which metrics to analyze and how to improve your efforts to reach those goals. Be clear, using specific details, so your whole team understands exactly what success looks like. For example, “drive more traffic” and “gain brand awareness” is far too vague. What do we want to accomplish? Next, identify what data you’re looking at and how to measure your progress. Find the metrics that matter the most to your goal. Rankings – where are you ranking on a global, national, and local level? Links – how much growth or decline are you seeing in your links? SERP Ownership – looking at pages for search results for a query, what results are showing and how do they impact your reputation? Organic Search Visits – how many visitors are coming through organic search? Search Volume – how many people are searching for you? Referral Traffic – how many visitors are coming from links to you? These metrics should align with your end goal. For instance, you wouldn’t look at returning visitors if your goal is to boost new visits by 30% in three months. You don’t want to set yourself up for failure right off the bat. Ensure your goal is actually realistic. If you’re overpromising and under delivering, you will lose support from leadership. So make sure you’re shooting for a target you can actually hit. SEO-driven content requires a great deal of time and effort. And of course, this means it costs money as well. Don’t commit to publishing six blog posts a day if you’re a one-person content team. Clearly identify who will be on your content marketing team, what each person will do, what tools you have at your disposable, and how much time you can commit to content. Starting with an ambitious vision is important, but ambition needs to be rooted in reality. Face it – you might not be able to compete with large enterprises for specific keywords if you’re a small business. Bounce goal ideas off your team while researching the competition you face. Identify opportunities that are achievable. As mentioned above, your SEO goals must align with your overall business objectives. Review the bigger picture to see how your SEO and content goals fuel larger goals, like increasing revenue. Also, ensure your goals fit your company’s values and add to the company mission. Establish the overall timeline of your efforts and show when you will actually see the results. This should outline deadlines along the way so everyone involved knows exactly what needs to be done and when these tasks should be completed. In terms of SEO and content marketing, it can be difficult to accurately estimate when you will see results from your efforts. Make an informed estimation on the timeline. In the world of SEO, there are marketers who use black hat tactics and those who use white hat tactics. The approach you decide to take makes a world of difference in how your content ranks. Simply put, if you adopt black hat tactics, you’re going to be penalized by the big G. But if you play by the rules using white hat SEO tactics, your website will rank higher and you will reach your content marketing goals. The black hat is often associated with villains and antagonists in many forms of storytelling. And that evil association translates to the SEO world. 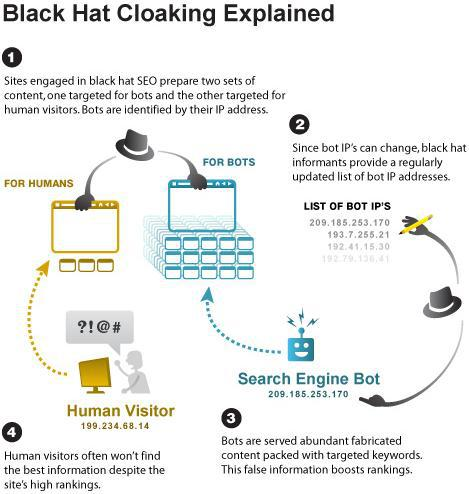 Those who practice black hat techniques are working around rules to earn SEO results. Black hat tactics are bad practices that could provide ranking boosts in the short term, but these tactics can get your site banned or penalized by search engines. They violate important webmaster guidelines. Show site visitors another set of content that is different from what search engines see. This is common in various forms. As you can see, this content is low quality. Use a software that creates distorted text using keyword phrases just to get visitors to come. For example, a website would rank high for a specific keyword, like employee wellness app. But when the visitor arrives, they don’t see any relevant content. Your page gets indexed for a specific keyword, then the page is changed for visitors. Obviously, thanks to the advancements of search engine technology, these techniques are less and less common. Plus, the benefits are short lived. Your black hat website will anger visitors, your credibility will suffer, and Google will stop ranking you. But these black hat tactics aren’t just used by small operations striving to dupe visitors or shady pornographic websites trying to boost traffic. Back in 2011, Forbes got busted by Google for link spamming. They hosted a resources section of a page about e-business that included links. However, these links led to paid ads. And they also suffered Google penalties in 2007. They were caught selling paid links. When Google released the PageRank update, they were among the biggest publishers who took a hit. Other notable publications included Washington Post, Copyblogger, and SFGate. A bus tour company in San Francisco accused the digital coupon giant of using a bait and switch technique in 2011. Groupon ran text ads that mentioned tour discounts in San Francisco. The problem: they didn’t actually have tour discounts to offer. Viewers who clicked the ads found no landing page offering such discounts. This ultimately hurt the San Francisco bus tour company’s rankings. In 2013, Google found user-generated spam on Sprint’s website. Their offense was similar to both BBC’s and Mozilla’s previous penalties. A portion of Sprint’s site was open to the public for anyone to post links and content. But the problem was that visitors were spamming the site with links. So it’s obvious that you as a marketer and content creator should not adopt black hat tactics. 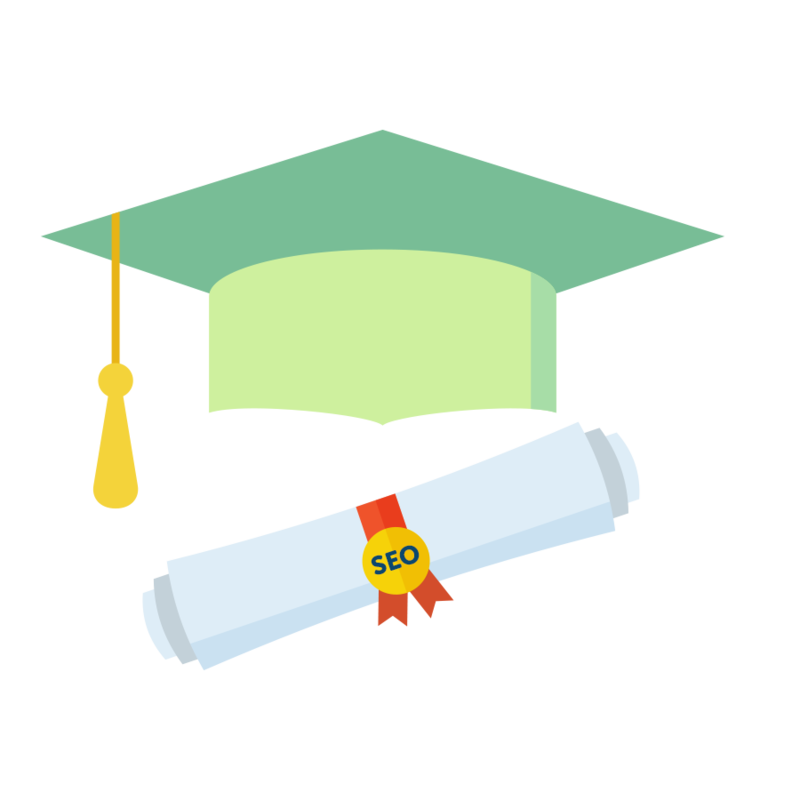 But what if you are looking to partner with SEO professionals and agencies? You might not know how they are “optimizing” your website. If they use these black hat tactics, you might not notice. Then, you’re stuck with Google penalties and struggling to re-establish your credibility and boost your rankings. They make unrealistic promises, like guaranteeing high page ranks in minimal time. You see an influx in hundreds or thousands of links to your site. They promote super low prices – SEO requires a lot of time and ongoing support, so it should be costly. They claim to know “secrets” or say they know someone who is on the inside of Google. 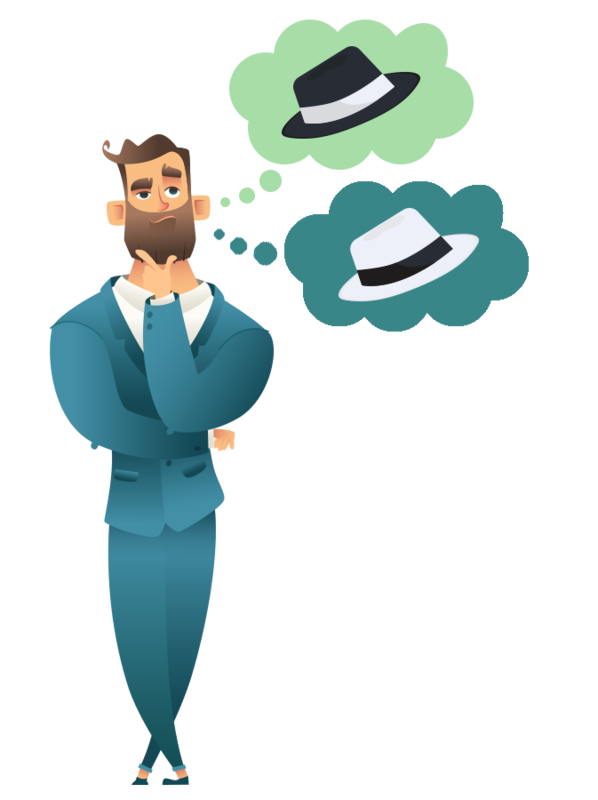 Contrary to black hat SEO, white hat SEO techniques are actually in line with search engine terms and conditions. These practices improve your rankings and deliver long-term success without the anxiety of getting penalized by Google. Meta tags are snippets that describe the content on your webpage. They appear in the page’s code and tell search engines exactly what the webpage is about, which improves your SEO. Meta Description – a concise explanation of the page. Title Tag –the text you see at the top of your browser, and what search engines see as your page title. Meta Keywords – a list of keywords relevant to your webpage. For the most SEO value, pay close attention to all these types. While aspects like meta keywords don’t directly factor into Google’s ranking algorithm, most of these meta tag types benefit the overall visitor experience. A strong meta description that includes relevant keywords can entice searchers to select your webpage when they read the preview in SERPs. Meta keywords are also not a factor impacting Google’s algorithm. Thanks to keyword stuffers and other black hat practitioners, Google gives no SEO value to them. Simply put, they’re far too easy to abuse and cheat. Title tags, on the other hand, directly impact your rankings. They are visible to searchers in the browser and to search engines as well. Your title tags can both inform your audience and show search engines that your content matters to specific search queries. The user experience plays a vital role in your SEO efforts. Google looks at many aspects of your website, including how long visitors spend on your site. If you deliver a poor user experience, your bounce rate can skyrocket, which will hurt your rankings. Navigation and visual appeal play big roles in the overall user experience. When it comes to visitors perceiving your site visually, they assess visual appeal as quickly as 50 milliseconds, according to a 2011 study published in Behaviour & Information Technology. This is why the blink test is so important to pass. Your website design should be both visually appealing and intuitive. This way, visitors like being on your site and know exactly where to find relevant content. Products and services, content information, and company information are the top information people want to see available on a vendor website homepage. Poor design and navigation are among the top website elements that annoy buyers and cause them to leave. Poor design and navigation are also among the top reasons for reducing a vendor’s credibility. 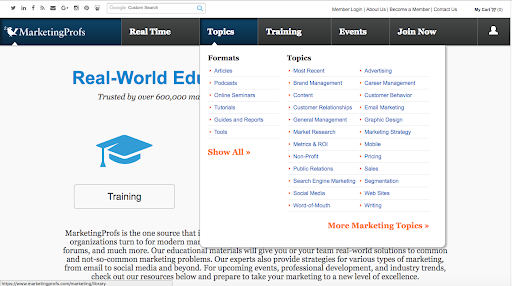 One of the best examples of excellent navigation design comes from HubSpot’s homepage. As you can see, visitors can easily find their way to areas of information relevant to their needs and interests. When you hover over the dropdown menus, you get an expanded look at related areas. For example, if you’re interested in features of the software, you simply hover over the software option and access five options – the free CRM, marketing hub, sales hub, service hub, and integrations. Plus, if you need direct access to the organization, you can use both the HubBot on the bottom right and the contact us page in the top left. There are several types of navigation you can choose from. When you’re deciding on how to design navigation, consider both the visitor and search engines. Obviously, you want search engine crawlers to easily find your links, but you also don’t want to sacrifice the user experience. A common best practice is providing global website navigation. Global website navigation shows the top pages and sections of your website on each page, often listing the main content sections of your website. This simplifies the user experience because no matter where the visitor is on your website, they can find other content sections in a snap. The global navigation links tell search engine crawlers exactly what pages you consider the most important. These links make it easy for both visitors and search bots to get to each page. So it’s a win-win for everyone. One plain bar that houses all important navigation links in one row. As you can see, all the pages are clearly identified for visitors. Best option for: websites that include a handful of important pages. Similar to single bar, this option contains a primary navigation bar as well as a secondary bar, which shows additional options. This gives you the chance of adding even more internal links for your visitors to find without over-cluttering your homepage. Best option for: websites that have several important pages that won’t fit on a single bar. Drop-downs allow visitors to hover navigation items to access a secondary list of links. Some websites use double bar drop-downs. For example, MarketingProfs’ homepage from early 2018 nails this style. As you can see, the top bar includes links to their social media platforms, a search bar, member login, and much more. What’s nice is this bar disappears as you scroll so it doesn’t feel crowded as you look for content down the page. The drop-down style is perfect because they have so many content areas within each section. The topics drop-down helps you easily find formats and topics to dig deeper quickly. Best option for: websites that need more links than what can fit on double-bar formats. One of the most complex structures, this design includes flyout menus that can be accessed like a drop-down menu. 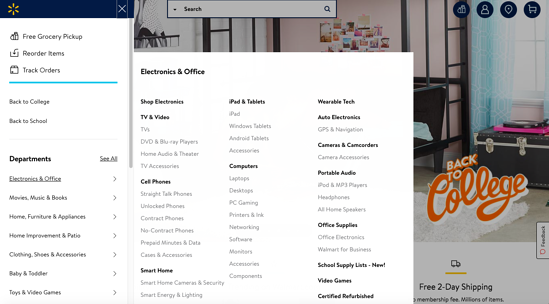 Arguably the most recognizable and prominent drop-down flyout navigation comes from Walmart. You simply hover over a department, then a flyout gives you plenty of other subcategories in a huge menu. Best option for: ecommerce sites and other websites that include a huge selection of links with nested categories. Back in 2015, Google announced that more searches took place on mobile as compared to desktop search. According to 2018 Statista research, a whopping 52% of all website traffic worldwide was generated through mobile phones. To put it simply, a poorly optimized mobile experience will significantly hurt your reach. If your visitors struggle to navigate and engage with your content through a mobile device, you’re going to see a huge portion of your audience fall off. Bounce rates will soar. Mobile traffic will stagnate. And your brand could lose authority and credibility. So what are the best practices for building an SEO-friendly mobile experience? Mobile visitors are goal oriented, and they want to find what they need quickly and easily. Build menus that are short and concise. If you’re building forms, only ask for a few bits of relevant information. Make your primary CTAs front and center in prominent space with a big button. When authoritative sites are linking to your content, search engines recognize you as a credible source, which will eventually help you rank higher. These backlinks act as a vote of confidence from other sites. But not all links are created equal. You want backlinks from high-quality resources, not spammy sites. Perhaps the easiest, most straightforward approach to earning backlinks, this always works. If your content is unique, informative, and high value for your audience, others in your industry will link to you and reference your content (more on this later). Submit contributions to other sites. Guest blogging at reputable sources is still super valuable. The more you educate your audience through high-quality websites, the more recognizable you and your brand become. But also, when you guest blog, you typically include links to your website within your content and your contributor bio. Even if the link back is a nofollow, you earn SEO value indirectly through driving traffic and building brand awareness. Influencer marketing helps you promote your services and ideas through popular social media figures and content creators. When you connect with influencers who have huge followings, you can expand your reach immensely when they share your content or if you collaborate on content with them. Once you identify directories that are high value, you can connect with them and earn backlinks. For example, the Better Business Bureau is one of the most reputable, impactful directories. As mentioned above, this is the most obvious (and overlooked) white hat SEO practice. You need content, but if you’re just adding filler to your site, you’re not going to see better rankings.  Content is NOT king. If you’re just publishing for the sake of content, you’re wasting a lot of resources on low-value content. Don’t cut corners during your planning and ideation process. Do always start with your buyer persona in mind. Don’t copy what others are doing. Do research your competitors and differentiate yourself. Don’t dilute your tone to a dull, faceless corporate entity. Do develop an engaging, personable voice and share your unique perspective. On-page SEO involves everything you can do as a content marketer to make the most out of each individual webpage. This includes both the source code and the content itself on each page. Your on-page SEO should be your prized possession because as content marketers, you have control over all of the on-page aspects. There is no excuse for overlooking SEO efforts as a content marketer. While SEO can feel complex and be difficult to stay informed on, the good news is that a lot of the heavy lifting can be executed by SEO tools. There are several SEO tools that are both free and paid. Many of the tools accomplish similar tasks, but most developers design tools that offer unique benefits. Who says you have to pay for quality tools? There are several tools that can help you execute an awesome SEO strategy free of charge. View organic search traffic metrics. Measure the quality of organic traffic. Keep an eye of UX aspects like page loading speeds. Customize an SEO dashboard with powerful widgets. Review organic keyword-specific metrics, like pages per visit. This is just scratching the surface. Depending on how in depth you want to get, you can leverage the power of Google’s data to make the most of your SEO efforts in so many more ways. Another amazing free tool from the best of the best, Google Search Console is a must-have in your SEO toolkit. This is the best tool to help you ensure that your webpages are being indexed and can be found through search queries. Within the tool, you can gain a clear understanding of how your site appears in search. You can look at the analytics of queries, pages, search type, etc. Also, you can see clicks, impressions, CTR, and positions. The suite of tools from Google is impressive to say the least. Google Data Studio is one of the newest additions. In the simplest terms, this tool helps you create visually appealing, simplified reports that are customizable. But you can pull in more data from other sources outside of Google Analytics as long as that data is put into a Google Sheet. The best part – the reports are dynamic. When your data source updates with new information, your reports do too. This is the best tool if you love looking at analytics data outside of boring old spreadsheets. As a content marketer, you can make the most out of this tool by creating SEO reporting templates. These reports can give you all the information you need at a quick glance. From one of the most reputable search marketing agencies, the Screaming Frog SEO Spider Tool has a lot to offer. There are both free and paid versions. Find duplicate pages on your site. Analyze titles and meta data on each page. Review meta robots and directives. Identify errors, redirects, and broken links. Conduct an audit on hreflang attributes. This is an excellent, super simple free tool that can guide you through a thorough SEO audit. The paid version does not have a URL limit and provides other awesome features, like Google Analytics integration, free technical support, and custom source code searches. Launched in 2014, Keyword Tool is one of the best free resources for researching keywords and phrases. It uses Google’s autocomplete as well as suggestions from Bing, YouTube, Amazon, eBay, and the App Store. The free version can provide over 750 long tail keyword suggestions for any search term. In fact, you don’t even need an account to start making the most of this tool. Simply type in a keyword and get your list of relevant long tail options. The tool also provides keywords in the form of questions and adds options that include specific prepositions. You can copy all the suggestions or export your list in an Excel spreadsheet or CSV. When you use the paid version, you gain access to search volume, trend data over the last year, cost-per-click (CPC), and competition ratings. User experience is often overlooked when it comes to SEO, but it plays a vital role in optimizing your site. This is where GTMetrix comes in. This tool makes it super easy to test important elements, like page load speed, page requests, and other KPIs. You can also schedule regular testing to monitor pages, analyze page performance on mobile, and identify where bottlenecks occur in the user experience. But as with most free SEO tools, there are some limits. They offer several tiers of paid versions with additional features and fewer usage restrictions. One of the best Chrome extensions for SEO whizzes, the MozBar is a powerful addition to your toolkit. With it, you get an instant reading of a website’s page authority, domain authority, a link analysis, and spam score. The on-page highlighter allows you to highlight keywords on a page and differentiate links by types, including external, internal, followed and no-followed. Plus, take the data with by exporting your SERP analysis in a CSV file. Touting itself as the “all-in-one” SEO platform, Serpstat does not underwhelm. They offer free trials with a limited number of queries. The free tools not cutting it for your needs? Look at the paid upgrades for free tools that offer them, and consider these higher end SEO tools. Find competitors’ keywords, monitor changes in position, and identify new organic competitors. Identify the best keywords for your SEO and PPC campaigns, explore long-tail options, and find related keywords and phrases. Conduct a deep link analysis, check backlinks to see if they’re nofollow or follow, and review referring domains’ authority. Review your competitors’ ad strategies, identify top performing keywords, and better optimize local ad campaigns. Analyze your competitors’ display ads, learn best practices by reviewing Google’s Display Network’s best performers, and check displays on different displays. Find who your product listing ad competitors are, identify their best performing listing ads, and spy on their product feeds. Outside of these reports, you can do so much more with their other tools, like an on-page SEO checker, social media tracker, site audit, and content analyzer. One of the most overlooked SEO strategies you need to be working on is outreach, which makes link building a snap. And instead of manually hunting down influencers you want to connect with, you can use Buzzstream to simplify every step. With this tool, you can find influencers based on keyword searches, gather a URL list to automatically collect and track contact information and their website and social metrics, and much more. Outreach tools like this can fuel your content promotion and link building strategy. Manage all your conversations through Buzzstream and build reports to track your campaigns. look through 15 million blogs, filter by keywords, and look at social networks bloggers have. import influencer lists to find a URL’s social footprint and track social, SEO, and blog datapoints. organize your blogger database, automate research, and track more than 50 metrics, rate bloggers, and manage blogger contacts you can use in your campaign. monitor and track blog post and social engagement and combine reporting with your Google Analytics. Make the most of this tool by collaborating with influencers, expanding your outreach, and using metrics to improve your content strategies. Building relationships to expand outreach and promote content can take time. This is where tools like MailShake come in handy. This helps with writing, sending, and managing cold emails. Within the tool, you can use templates for guest posting, content promotion, PR pitching, link building, and lead generation. You can also create and save your own templates. 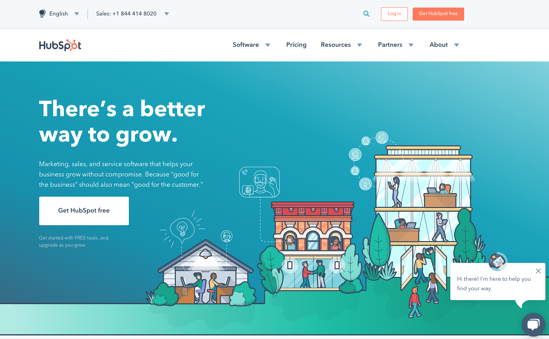 MailShake helps you collaborate with designated teams, automate follow-ups, schedule your messages, monitor engagement, and organize your leads. It integrates with several common softwares, like Salesforce, Google Drive, and more. The pro tier includes conversion tracking and A/B testing features. Bottom line: This is a must-have email outreach tool. One of the best all-in-one tools, SEOmonitor provides features that help with keyword research and tracking, competition insights, content performance, and so much more. Their proprietary Visibility Score acts as a signal that tells you the overall impact on your SEO performance. It combines rankings and search volumes. Also, their Topic Explorer is incredible. It reads the semantic relationships between keywords and searches through billions of connections to deliver a bird’s eye view of an intent topic. This is essential now that keyword research is limiting. One of the coolest benefits is their support team. They help you through every step of the way – from migrating your old data from your previous SEO tool to training and general support. There’s no denying the power of Ahrefs. Not only do they provide the most comprehensive data (thanks to their AhrefsBot, which is the second most active web crawler after Googlebot), but they earn an incredible reputation as the go-to backlinks and SEO analyzer. Their platform is robust, including features that help with rank tracking, backlink research, content research, competitive analysis, and much more. One of the best tools within the Ahrefs arsenal is the Content Gap feature, which helps you find keywords your competitors are ranking for that you want to rank for. It automates your strategizing process, saving you hours and headaches. You simply add all the keywords your competitors are ranking for and subtract the keywords your own website ranks for, leaving you with a comprehensive list of the keywords you should be targeting. As the name implies, Agency Analytics is your best tool if you’re working for an agency. You can enjoy reporting, SEO tools, and project management, just to name a few perks. Build a customized dashboard that fits your needs and gathers all your reports in one place. Simply add widgets that you want to see on your dashboard and add your branding, which is valuable when you want to share results with your clients. For project management, you can assign and collaborate on tasks and projects, customize user permissions for your team members, and monitor your campaigns. In terms of SEO, you can audit sites to find on-site SEO issues to fix, track competitors and your daily rankings, and oversee backlinking strategies. This tool simplifies your data by allowing you to integrate all data sources for everything, including SEO, PPC, social, call tracking, and email. One of the most prominent SEO tools in the market, Moz Pro solutions are hard to ignore. You can build custom reports for your campaigns, track rankings for your site and your competitors, research keywords and build lists for each campaign, and much more. Their site crawl stands out as a top feature because it’s fast and it delivers all technical SEO issues you need to address in one report. What’s even cooler, it continues crawling your site weekly and alerts you when major issues arise. Link Explorer walks you through analyzing your link profile and helps you find competitive link opportunities. This is essential to improving your page authority and domain authority, which plays a big role in your ranking potential. Aside from the keyword research tool, SpyFu really stands out for its competitor analysis features. You simply search for your competitors and run a report on their PPC and SEO strategies. Learn what keywords they’re ranking for, find which ones you want to compete for, automate keyword grouping, and track the complete ranking history for any page or website. As you conduct your SEO strategy, track and monitor your impression share and ranking progress for your keyword groups. Plus, you can brand your reports if you’re working with a client. Every SEO experience can differ, depending on your goals and strategies. But that doesn’t mean you can’t learn about common obstacles and situations content creators and marketers face. Here are your most common situations you’ll face and step by step instructions on how to succeed. Keywords and topics are vital to keep in mind as you develop your SEO strategy. While search engines are changing the way we approach keywords, your target keywords still matter. But it’s not just about keyword stuffing and ranking each piece for one particular keyword. Using your buyer persona research, focus on your ideal reader’s top challenges and pain points they’re looking to address. Start with five to 10 core problems you want to address. Then, list general topics that align with their problems. These should be broad topics. Break down each broad topic into a list of subtopics that have a semantic relationship. Use keyword research and content ideation tools to spark some inspiration. Map out your content strategy to show how core topics and associated subtopics align. Audit your current content assets to find gaps. Whatever you didn’t cover, list out content ideas and prioritize them. Pillar page topic – Identify what topic is covered in your pillar page. Cluster topic – Show what general topic the cluster content is associated with. Subcluster – Describe what subcluster the cluster content relates to (if applicable). Keyword – List what keyword the cluster content is optimized for. Pillar Link (Y/N) – Show if the cluster content has been linked to the pillar page. Re-linked (Y/N) – Write if the pillar page has been linked back to the cluster content. Other Action – Describe if you need to take another action with the cluster content. If not, leave this blank. Other Action Taken (Y/N) – Write “yes” or “no” to show the other action is complete. Links to pages – Add four columns here and include links to each live page. Your on-page SEO refers to the practice of optimizing each webpage. For every blog article or webpage, you should check off all the boxes to ensure you get the most SEO mileage out of every piece. You need to include your keyword in it, preferably at the beginning of the title tag. But also make the title compelling so when searchers see your result, they actually click it. 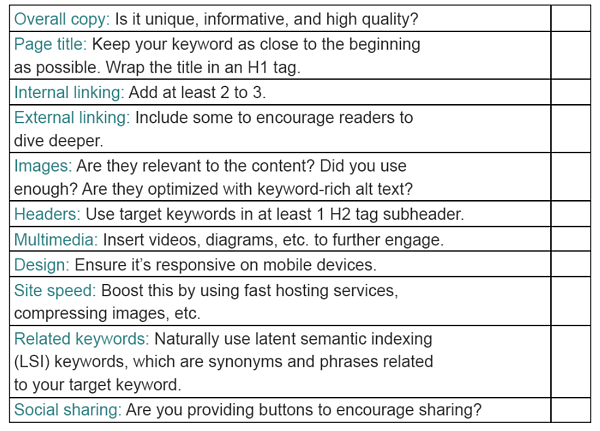 Your h tags play a big role in your SEO strategy. HTML stands for Hypertext Markup Language, which is a common language used in creating webpages. H1 – Use this for the headline. Only include one h1 tag per webpage. It should be used to describe the topic of your page, usually within 20 to 70 characters. It will be similar to your title tag and your title of your blog article. Use the other h tags with keywords naturally. URL (Uniform Resource Locator) is commonly known as a web address, specifying the location of a resource on the internet. It also includes information on how to retrieve that resource through the protocol (HTTP, HTTPS, FTP, etc.). They are readable by humans. The text within URLs replaces the numbers (IP addresses) that computers use to communicate with servers. Demonstrate what the page is about. This delivers a great user experience because it describes exactly what the webpage is about. Include keywords naturally. While URLs are a minor ranking factor for search engines, they’re still a factor to consider. Keywords can provide a small benefit to ranking. 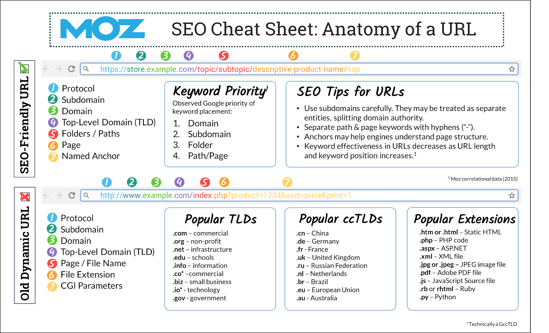 Moz provides this awesome URL cheatsheet to help you better understand SEO and user-friendly URLs. These are HTML attributes providing summaries of webpages. They appear underneath the clickable blue links in SERPs. While meta descriptions aren’t tied directly to search engine rankings, they do have a major influence on clickthrough rates. They can encourage or deter searchers from clicking your webpage. The more clickthrough your webpage gets, the better your page can rank. Do: Make them read smoothly and include keywords. Don’t: Overstuff them with keywords and make them sound spammy. Do: Use compelling language that accurately represents what searchers can find on the webpage. Don’t: Deceive searchers with vague or unclear descriptions. Keep in mind, if your meta description is not adequate in the eyes of Google, the search engine could find a snippet on the target page that better matches the query and use that instead. User experience – When you’re strategic about internal linking, you can guide your visitors through several pages on your website. Make the link followed: No-followed links tell search engine crawlers to ignore it. Include links in the body of your webpage: If you bury it in the footer or sidebar, they don’t carry as much value. Ensure relevancy: If you’re linking to other webpages that don’t make sense, search engines will learn, and you won’t earn link juice. Don’t overthink anchor text: Use naturally occurring words and phrases to hyperlink. No need to optimize anchors. Mix keywords with natural variants (synonyms and related phrases). Search engines can understand relationships between variants and your keywords. Rename images with descriptors, and optimize your alt text for images so Google can learn about the relevant image. High-quality content matters because if your metrics (like bookmarks, repeat visitors, and shares) are good, search engines will acknowledge you as an authority. Add social share buttons so readers can distribute your content across multiple platforms. When your content is shared, search engines notice your content is valuable to many and worth ranking higher. Site speed: Users want to find and consume content quickly. Work with your hosting provider to ensure your load time is the best it can be. Otherwise, if your webpages take forever to load, you will see high bounce rates and less returning visitors. This is arguably the most important aspect of your SEO strategy. If you’re not measuring and analyzing SEO metrics regularly, you don’t know what’s working, what’s not working, and how you can improve your efforts. Follow the NAP approach – numbers, analysis, practice. Pageviews – number of views each particular webpage earns. Average time on page – shows how visitors consume content, either glancing at it or reading it through to the end. Unique visitors – how many visitors your content is attracting, which shows a good size of your audience. New and returning users – how your content attracts and retains new audiences. Bounce rate – how many users left a page without visiting other website pages. You should also look at engagement (social shares, comments, mentions, etc.) to see what users do with your content. But numbers are just numbers without context. Read through your metrics, then connect them to actionable takeaways. Each metric tells a story. For example, if a particular blog article has a high bounce rate, that means when visitors land on that page, they’re not satisfied with the content they see. Look at every aspect of the content. Does the title align with the body of the article? Is the content well organized and high value? At this stage, with your data and takeaways handy, you’re ready to take action. Start putting what you learned into practice. For example, if your analysis shows that your blog articles that are over 1,000 words generate more leads than your shorter articles, adjust your content strategy to account for more long-form articles. As you experiment, continue measuring your SEO metrics and adjust accordingly. But remember, SEO results take time. So give your experiments time so you can gauge your results accurately. Social shares can ultimately pay off big in both expanding your brand awareness and potentially improve your search rankings. While social signals are not a ranking factor, search engines do crawl social sites like they do any other site. When your content is shared, it’s being promoted, which can lead to more engagement and traffic. It can also lead to link building, which builds your link equity and improves your ranking. Don’t overlook the power of social media profiles. Not only do they rank, but they can also be an extension of your brand. It delivers a fun, unique experience for your readers. The process of historical optimization is essential to your SEO strategy. Essentially, historically optimizing entails dusting off your old content and adding fresh, updated content. The main goal of historical optimization is to ensure accuracy and comprehensive. This way, you’re delivering the most value with every piece of content. The benefit is that you can generate more traffic and more leads. Run reports to find blog articles that are outdated or can be improved and have the potential to rank higher for keywords. Update the content enough so the article has noticeable improvements. Without changing the URL, simply unpublish then republish the content so it appears as a new, featured article on your blog. As a content marketer, you need to stay on top of the latest SEO best practices. One of the biggest challenges you will experience is evolving with the world of SEO. A whopping 40% of marketers say the most challenging obstacle to SEO success is changing search algorithms. But search engines aren’t the only thing in the SEO world that is evolving. Searcher behavior also changes as new technologies arise. For example, voice search is a new frontier. This is where adopting a lifelong learner mindset comes in. Stay committed to reading the latest studies and subscribe to the industry’s top resources. Siri. Cortana. Google Voice Search. Alexa. There are plenty of virtual assistants making voice search easier than ever before. And thanks to this new technology, search behavior is changing. Voice searches are more conversational and often include more words. The role AI is playing in search is changing the SEO landscape in big ways. First of all, it’s making search far more human. Google’s RankBrain uses machine learning to better understand content’s meaning, improves results accuracy by using feedback data, and infers intent when searchers enter ambiguous queries. Predict search trends using predictive analytics tools, like Google Trends. Group relevant content into topic clusters to help search engine bots find related content on your website. Consider variations of keyword phrases, including exemplars (phrases that mimic the natural structure of a query). UX will always play a vital role in all of your content marketing efforts. You want to stay in touch with UX design and best practices so the content you’re offering is enjoyed in a simple way. As previously mentioned, your site’s speed, navigation, mobile friendliness, use of visuals, and much more all influence UX. In your role as a content marketer, you need to always keep UX at top of mind as you continue creating. In a digital world, we have access to endless amounts of information. This is great because we can commit to constantly learning and growing professionally and personally. But the more we read, watch, and listen to, the more overwhelmed we often feel. Consuming educational content every day can sometimes feel like drinking water from a hose. In fact, taking in a ton of new information can be counterproductive because it will take a lot of your time, but you won’t retain much information. Fortunately, there’s a simple solution to managing this information overload and actually remembering what we learn. And it dates back to the 15th century. Also referred to as a commonplace book, this is simply a tool that acts as a depository for all the ideas, concepts, anecdotes, and information we consume every day of our lives. You can build and manage your commonplace in any way that works best for you. Some prefer old-school tactics, like handwriting notes into a notebook you store and refer back to. Others like digital solutions, especially thanks to amazing note-keeping programs like Bear and Evernote. You could also combine both digital and physical methods. Just make sure your system makes sense to your process of learning. 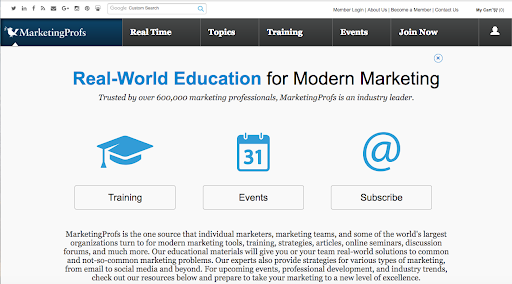 Synthesize and organize what you learn on a variety of topics within your industry. Improve your retention and stay engaged with what you're learning in your work. Gain clarity for your creativity and thought processes to make the most of your daily output. Stay motivated to continue learning and gathering new information to expand your knowledge and expertise. As you develop a commonplace system, you will see a huge difference in your personal and professional life. You will be able to recall more information and better comprehend new concepts. The commonplace will give you a big advantage in your career as a content marketer.